Swansea’s meteoric rise from the basement of the Football League pyramid in 2004 to the heady heights of the Premier League, and now League Cup winners just nine years later, is an astounding tale. Next year the Swans will be playing European football; a chance for Welsh football to showcase its burgeoning ascension on the continent. Domestically, the Welsh game is in sound condition. For the national side it has been a trying time, especially after the Gary Speed renaissance was tragically cut short in 2011. Chris Coleman has presided over eight Wales matches and has seen just two victories, only one of which was in a competitive international. Wales’ wait to reach an international tournament will likely continue until the 2016 Euros, where they have a semi-realistic chance of participation thanks to the extension of the 16-team format to 24. Since the abrupt end of Mark Hughes’ reign in 2004 however, the national side has been in perpetual decline – barring the brief honeymoon under the late Speed, which reinvigorated the stagnation that had set in under John Toshack, and saw Wales win three of their final four Euro 2012 qualifiers and climb to an unprecedented 48th in the FIFA world rankings. Although never the most accurate barometer of an international side’s merits, Wales now sit 68th in the current FIFA world rankings following their 2-1 victory over Austria earlier in the month. Victory helped the nation progress 13 places, but they still sit below such international powerhouses as Libya, Sierra Leone and Uzbekistan. But time is on both theirs and Coleman’s side, after the annus horribilis that was 2012. Of the 24-man squad selected for the recent friendly, 15 were aged 25-or-under. Some are young prospects developing in the game, such as 19-year old Swansea defender Ben Davies and 21-year old Celtic defender Adam Matthews. Others have become established Premier League peformers, from Jack Collison to Aaron Ramsey and Joe Allen. And then there is Gareth Bale, still only 23 and, seemingly, with the world at his feet. As he showed with his late double in the World Cup qualifier victory over Scotland last year, and more recently with a succession of sublime goals for Tottenham Hotspur, Bale’s end product is beginning to match his talent. After being fast-tracked into the PFA Players’ Player of the Year in the 2010-11, a reward more for two barnstorming performances against Inter Milan in the Champions League than a sustained period of brilliance in the Premier League, Bale enjoyed a subdued 2011-12 season. Under the guidance of the tactically astute Andre Villas-Boas, the Welshman’s game has flourished in a more central position. A return of 17 goals in 30 appearances so far this season underlines his growing importance to Spurs’ assault on the Champions League places. Bale is a genuinely excellent footballer who has the potential to develop into a world class talent. Whilst the recent onslaught from pundits hailing him as the third best player in world football has been, frankly, an utter embarrassment, it should not act as a detriment to the judgement of his undoubted ability. Whilst Tottenham may worry that their own progress may not match his ambitions, Wales suffer no such problem. Whilst Bale remains a part of the Welsh national setup they retain a chance of progression to an international tournament, particularly if the likes of Aaron Ramsey and Joe Allen reach the heights of consistency that they are capable of. What is perhaps a concern for the FAW, is that of that 25-man squad for the recent friendly with Austria, only three represented Welsh club sides; Ben Davies, Ashley Williams (both Swansea City) and Craig Bellamy (Cardiff City). The domestic game in Wales is enjoying unprecedented success this season, which has been brought into sharper focus by Swansea’s comprehensive display in the Capital One Cup final on Sunday, but it has hardly been an overtly Welsh affair. Davies and Williams are the only Welsh first-team players in Swansea’s squad, whose success this season owes as much to the methods of their Danish manager, Michael Laudrup, as to the influx of Spanish players last summer, personified by the brilliant Michu, who apparently only cost £2m. Who knew? Cardiff, flying high in the Championship, are similarly under-represented by homegrown Welsh talent, boasting just Robert Earnshaw, fresh from a loan spell with Maccabi Tel Aviv, and the evergreen Craig Bellamy. But neither symbolize the future of Welsh football. It is a damning indictment of the Welsh game that, just as it is on the cusp of possessing two clubs in the Barclays Premier League, neither of those two clubs are sufficiently developing homegrown youth. Perhaps it is nitpicking, but something doesn’t sit right in that. 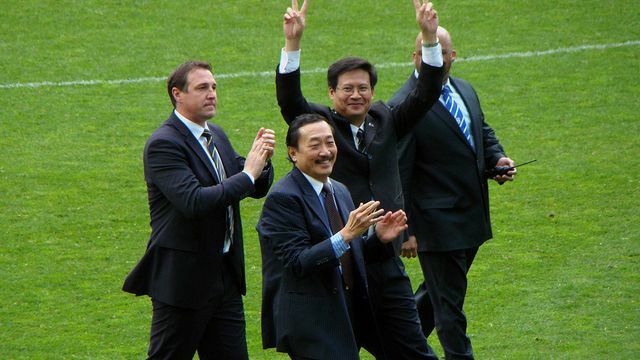 Concurrently, in the age of foreign, billionaire football club owners Swansea and Wrexham are shining beacons of supporter-owned football clubs, however Cardiff have had their own soul and identity sold down the river by a pair of Malaysian tycoons. The domestic face of Welsh football is growing exponentially; it possesses a club in Swansea that it can proudly show off to the world and a talent in Gareth Bale who has the ability to achieve anything he sets his mind to. But where is the future talent pool beyond the current national side? The under-21 side consists of a melange of Premier League and Football League performers, but those under contract at Premier League clubs are not playing consistently. Compare that with the England under-21 setup, whose captain plays regularly for Liverpool. It has been an exceptional season thus far for Welsh football, with Swansea consolidating their Premier League status and becoming the first Welsh club to lift the League Cup, just a year after Cardiff fell agonizingly short. Barring a catastrophic capitulation, Cardiff will be joining them in the Promised Land of milk and honey next season. But by no means should the FAW rest on its laurels. The future of the Welsh game, and its own homegrown talent, should be central to the consolidation of this upsurge, rather than the artificial proliferation of foreign talent and monies, which both Swansea and Cardiff have been guilty of respectively. This entry was posted in Analysis and opinion and tagged aaron ramsey, ashley williams, capital one cup, cardiff city, chris coleman, craig bellamy, faw, fifa, football league, gareth bale, gary speed, joe allen, john toshack, league cup, malaysia, mark hughes, michael laudrup, michu, newport county, non-league, premier league, rob earnshaw, spurs, swansea, tottenham hotspur, wales, welsh football, wembley, wrexham by James Dutton. Bookmark the permalink. Bale is the welsh ronaldo but ita downhill now for wales teams. Michu and Laudrup will leave for big teams in the summer and cardiff and swansea will be fighting the drop next year. Sad but true.